Advantages AqualityBox® versus membrane electrolysis. Legionella are water borne bacteria that can rapidly grow in favorable water conditions such as temperatures between 25°C and 50°C, used in buildings or evaporative cooling systems. For humans, however, it becomes dangerous when Legionella bacteria enter the lungs through spraying water (for instance when showering). This can lead to Legionellosis, a dangerous form of pneumonia. It is a notifiable but non transferable infectious desease, that can lead to death, especially for persons weakened by illness or elderly persons. According to reports from the European Centre for Desease Control (ECDC, 2015), 13 legionella contaminations per million inhabitants were reported in Belgium. In Germany, 1000 legionella contaminations were registered, whereby 5% were lethal. According several other German sources that number is significantly higher and is between 15.000 to 30.000 per year, whereby 10% are lethal. A periodic and temporary temperature increase above 60°C in a hot water system is called a “Legionella-circuit”. However according to German legislation DVGW W 551 (A) and W 557 (A), this is not a thermal disinfection. This kind of disinfection is no longer sufficient in case Legionella contamination was already present. It only leads to rapid scaling and wearing of fittings and seals and it contributes to making Legionella resistant to higher temperatures. Biofilm is a symbiotic community of micro-organisms sucha s bacteria, fungi or algae. It uses the metabolic properties and protective mechanisms from other species and serves as a grazing ground and protective zone for Legionella and amoeba, which in fact act as a host for Legionella. Stagnation, dead pipe ends, oversized pipes and storage tanks, insufficient water uasage, too low hot water tempeatures (<60°C) or too high cold water temperatures (>20°C), increase the biofilm growth. On February 9th 2007, new Legionella legislation came into force in Flanders (Belgium). Each owner or operator of a public building is obligated to have a Legionella action plan including risk analysis in order to reduce contamination due to Legionella. This legislation includes hospitals, homes for the elderly, schools, sports facilities, hotels, exhibition halls, etc,… and facilities that could form health risks such as cooling towers. Buildings are qualified as High Risk or as Moderate Risk Facilities, such as all buildings in the Health Care sector. All other buildings, accessible for the public, must comply with legislation such as Well Being at Work. Based on this legislation, all company buildings must have a Legionella prevention plan and can base themselves on the 2007 Legionella Decrete. In practice, this means that the operator of the building must write a Legionella action plan including risk analysis and has to execute it very precisely. The actions carried out should be kept in a log book with dates and measures. Next to structural modifications of the pipe work, a rinsing (flushing) program has to be put in place and each tap point rinsed weekly, in case of less frequent use. 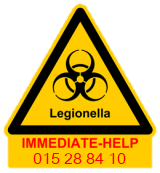 Legionella water samples should be taken on a yearly basis. Legislation has put forward a number of measures that need to be taken in order to create legionella safe sanitary water systems. These measures are depending on the kind and the purpose of the building. Cold as well as warm water circuits are treatable in a very cost-efficient way, which is often required. Active protection against the release of huge amounts of Legionella bacteria when flushing water pipes or removing biofilm. Efficient and continuous destruction of biofim through depot effect. No risk of skin burn like with thermal disinfection that requires water at 70°C at each tap point for at least 3 minutes. No heating up of neighbouring cold water pipes. Lower personnel and energy costs resulting in lower maintenance costs. Reduction of scale deposits in pipe work due to lower water temperatures. Avoidance of possible temperature resistance of Legionella. No need for hazardous chemicals required for on-site production of chlorine dioxide. No need for high risc explosion systems that are mixing chemicals. Avoid the formation of harmful chlorite and chlorate created when dosing ClO2 as end product in reaction with biofilm. No decomposition of the active ingredient during storage in a warm environment. No formation of the toxic chlorates due to decomposition of the active ingredient NaClO. Less odour and more neutral in taste. Avoid danger while not having all the necessary safety requirements typically for transport and storage of 15% NaClO as a harazous substance. Lower initial investment and operating costs hence lower maintenance costs. No corrosive by-product NaOH formed like in membrane systems which have to be disposed safely en secure. Simple, robust technology with intelligent measurement and control. “Plug & Play” system in order to retrofit easily into existing sanitary installations.